Waranga Shire (1865-1994) was proclaimed on 30 October 1865, and occupied an area of 2980 sq km in northern Victoria. It was reduced in size in 1879 when a westerly part was annexed to Echuca shire and again in 1886 when an easterly part was severed and became Rodney shire. After further adjustments the shire reached an area of 1644 sq km in 1970. Its western and eastern boundaries were the Campaspe and Goulburn Rivers. Waranga shire’s administrative centre was Rushworth, and its other towns included Colbinabbin, Corop, Murchison and Stanhope. 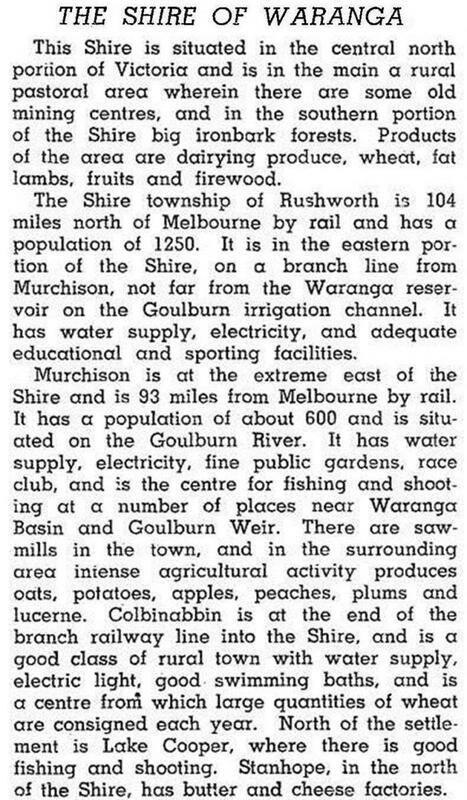 The shire’s name came from the Waranga pastoral run (1840), in which the Waranga Reservoir is now located. It is thought that Waranga is derived from an Aboriginal word meaning sing. The shire’s economic development has consisted of large pastoral runs, smaller farms which grew wheat and oats, irrigated closer settlement farms devoted to dairying and fat lambs, some orchards, gold mining in Rushworth and Whroo and timber harvesting from the extensive ironbark forests. The Waranga Basin reservoir on the Goulburn River was completed in 1905 by the State Rivers and Water Supply Commission to irrigate the west Goulburn Valley. By the 1960s irrigation waters were supplied to 490 sq km of farmlands in the shire from the Waranga, Eildon (Goulburn River) and Eppalock (Campaspe River) storages. Waranga shire’s arterial roads were on or just outside its borders: Northern and Midland Highways (west and north) and the Goulburn Highway (east). The shire’s interior depended on branch railways from the Seymour to Shepparton line, passing through Murchison to Rushworth (1890-1987) and on to Colbinabbin (1914-87) and to Stanhope (1917-87). On 18 November 1994 most of Waranga shire was united with Echuca city, Kyabram town, Deakin shire, most of Rochester shire and part of Rodney shire to form Campaspe shire. The balance was put in Greater Shepparton city.